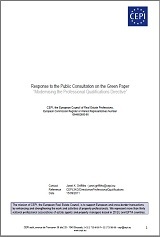 CEPI has responded to the public consultation on the Green Paper on modernising the Professional Qualifications Directive. The document raises questions on important issues concerning new approaches to professional mobility, such as the European professional card. It looks at ways of mobilising both the Member State of departure of a professional and the receiving Member State. It also looks at another important issue for CEPI, the reshaping of common platforms, their objective being to make compensatory measures for professionals from different countries redundant. No such common platforms have yet been developed and a new approach is needed. Other questions include ways of opening up the general system under the Directive which applies to those professionals (such as property professionals) who do not benefit from automatic recognition under the terms of the Directive. CEPI supports the efforts of the Commission to modernise the Directive and looks forward with interest to publication of the draft revised directive, which is expected before the end of the year. Read CEPI’s full response to the consultation.